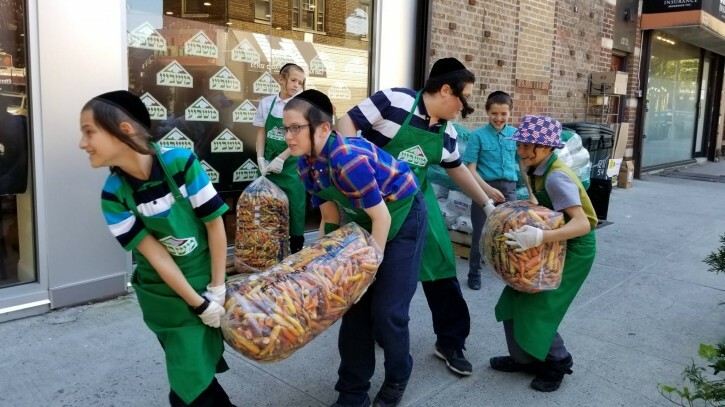 Brooklyn, NY - Hoping to be able to serve a greater number of individuals who are having difficulty making ends meet, the Masbia Soup Kitchen network is reaching out to synagogues and yeshivos in Brooklyn and Queens, offering group appointments that will provide greater convenience and dignity to those in need. The idea to invite clients to come to Masbia’s three locations in Borough Park, Flatbush and Queens in groups, instead of as individuals, was one that Masbia founder Alexander Rapaport had been considering for a while. But the launch of a new software system that simplified Masbia’s internal operations and allowed for private appointments had Rapaport putting his plan into play at all of Masbia’s client choice food pantries. “As a community, we aren’t so good at keeping exact appointments, but giving people a window of time where they can come in as part of a group provided the flexibility they needed,” Rapaport told VIN News. “What we wanted to avoid was the long lines that we have had where people could be waiting outside for an hour or more to get their food which can be very demeaning. Rapaport acknowledged that there might be those who would prefer not to pick up food in a room full of their peers, but that most enjoy the camaraderie which minimizes the stigma of coming to a food pantry. Masbia’s food pantries will continue their regular Thursday morning operations at all three locations. In addition to having groups coming from shuls and yeshivos, Rapaport said that the Flatbush Masbia site has a group of single mothers, while the Borough Park location has a group of families of six or more. Having gotten five groups at each of the Brooklyn locations on his own, Masbia attracted two more groups after being given an opportunity to announce its new initiative at a Flatbush JCC meeting held last week. Rapaport has also reached out to several synagogues in Queens in an effort to attract groups to that location as well. MOST PEOPLE EATING OR TAKING HOME FOOD FROM MASBIA ARE NONE JEWS. LESS THEN 10% ARE JEWS. RARELY DO YOU A JEW GOING IN THERE. I can confirm that 90% of the people eating or getting "Shabbos" packages at the Flatbush locations are not Jewish, mainly Chinese, Latino and Muslim I kid you not, giving Masbia is NOT maser. Its just a feel good position for Rapoport. So you only care about Jews? The rest of the world could starve? Not very liberal of you. What is the total budget for the Masbia Org? What is the Total Salary paid out to the Executive Director? Why is this operation still open after the Met Council debacle considering it was a partnership? Why is Met Council still open after WR debacle? Why are the rich people in our community not helping the poor with cash? Why are we utilizing 1930s style soup kitchens in 2018? So many Mega Millionaires and Billionaires in BP, FB, Queens, and LW, why a need for soup kitchens??????????????????????? Who and what is really behind the Soup Kitchen and Food Pantry network across America?????????????????????????????? Why do foundations and nonprofits associated with food charity have a leftist bent and focus on "sustainability"???????????????????????????????? “ What is the total budget for the Masbia Org? What are YOU doing about it??????????????????????????????????? simple Met Council has as its board chair Meryl Tisch a mega politician donor, enough said, Masbia does NOT help Yidden primarily. the point is they are asking YOU for money, if it was just govt money like that COJO of Flatbush who help illegals become citizens its one thing. but what Masbia does is actually geneivas daas they claim to help Yidden when they are helping 90% non-Jews which isn't better than the United Way. MASBIA is NOT a Jewish charity and giving maser to them is asur. As per guide star there are 5 separate Masbia entities with separate EINs. According to Form 990 highest paid officer in 2016 for Masbia Brooklyn was AR who received base salary of $162,523 - within line of typical non profit executive directors and much less than WR was getting from Met Council not including skimming. Total gross receipts from all 5 seems to be about 3.8 million. Don't know how much is spent on food, employees,rent, and "OVERHEAD". How’s it on your dime, groise knacker? Are u a Rov, that you’re paskening it’s not maaser to donate to them, hashomer? Liberal idiots shouldn’t be doing so. You must be a shaliach of the Novominsker who made that statement at the Agudah convention.What are "YOU" doing about it. I think the Q Question of why are our super wealthy community members are not doing enough to help our Aniyim is a good place to start. How about this suggestion. Instead of shlepping down to Washington to chanfen people like Charles Schumer ,Debby Wasserman Shultz, and the like, so that you can get more govt. money, how about contacting every tuition committee in our communities, and every Rov, and finding out who is struggling financially, and end the poverty so we don't need organizations like Masbia, Tomche shabbos and so on. I believe the resources are there in our own community many times over to do just that including ending the "tuition crisis" without government money. I do not have to name names, but Boruch Hashem there are many very successful people in our community and I think a lot more could be done when it comes to Tzedaka. Given the comments above, I feel compelled to state, that a number of years ago, when I was going through a very difficult financial crisis, I went to Masbia for dinners. I was always treated with dignity and am forever grateful that Masbia was there in my time of need. ok, but were you the only Jew or at least one of a couple meaning in the minority? I have to thank you so very much for stepping up to the plate to approach all these super wealthy askonim to pay for all tuition so that we can all live tuition free. When we see that all tuition has been taken car of and there are no more poor people needing food, we will all thank you and be in your debt of gratitude. bec. all these self appointed askanim don't care they just want to be in the paper so they can say I am a big macher make my kids a big shidduch with another rich guy. the tuition crisis is real and its hurting us, masbia's resources are going to non-Jews that can be helping yeshivas. It is NOT masser to give them money its the equivalent of giving to UJA-down the drain. Based on most of the above comments, especially psychotic #14 which somehow mentions me, I can see why so many people hate Jews. The alt-yidden are blatantly racist bigots who can't see helping another soul, or understanding anything "foreign" to them, which is almost everything, including America. I give credit to Masbia; when Hurricane Sandy struck NYC a few years ago, many parts of Brooklyn and the rest of NYC were either flooded or blacked out for days on end. Masbia fed many hungry people at that time, of all races and religions. I take my hat off to them. I protest against those self serving holier than thou hypocrites, who protested the fact that 90% of the food goes to gentiles. What was it their business? Charity extends to all, both Jew and non-Jew. It is a great mitzvah to feed hungry people, no matter what their religious affiliation is!! Ever hear of the United Nations Plan, Agenda 21 and Sustainable Development? The entire notion of modern day soup kitchens, food pantries, food banks and so on has nothing to do with charity and alleviating poverty. It is about creating dependence and control over the population and getting them to subsist on handouts and live in subservience as part of the eugenics agenda. This is partly why the clarion call is "alleviating hunger" rather than "ending poverty". They do not want to end poverty and the welfare state. They want you to learn how to live on very little in order to help "conserve" the resources of the earth, which are under threat from an ever expanding "population explosion" of people. Another linguistic sleight of hand creation of the left is "Food Insecurity" together with "Social Justice". The food charity industry in the US is part of the socialist agenda of the Left and the Democratic party. It’s so sad when someone can’t see they’re a laughingstock. Poor snowflake.